Obsolete. Code last updated 7 years ago. Chrome store links are long dead. Source code still available though. A new answer and a new question notification on Mac OS X. Whenever these things happen you receive a desktop notification like the ones shown above. This means no more refreshing the page of your favorite SE sites to look for questions to answer or new inbox notifications. You just wait until you are notified and then click the notification and a new tab opens for you. You can create as many Search Profiles as you like. On the options page you can also connect to your SE account (or disconnect from it) which you need to do in order to receive inbox notifications (which include new answer notifications, new comment, etc.). As notifications come up you can click on them to open a new tab with the question, answer, comment, etc. Notifications will disappear after a few seconds or after you click on them or dismiss them. You can left click the NQ button to get a popup where you can see the last few questions that were shown in notifications. You can also stop and restart showing notifications (useful if you want some distraction free time) by clicking the button at the bottom of the pop-up. This is done with a Google Chrome extension which checks every minute or so for new questions with the desired tags using jQuery and the StackExchange API 2.0. If a new question or unread inbox item is found a Desktop Notification is sent up using WebKit's implementation of the HTML5 Desktop Notification system. The tags and site you are interested in are set using the options page which can be accessed by right clicking the new "New! Q" button. These settings are stored in HTML5 local storage. 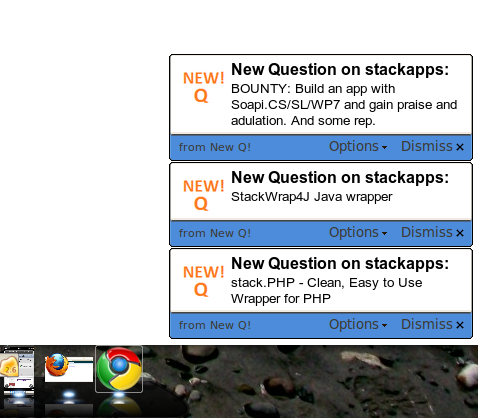 The UI for the options page and the popup use KnockoutJS, jQuery, and Bootstrap by Twitter. This will fix a bug where some questions were missed for notification. Auto-closing of notifications is now an option on the options page and can be turned off and on. You can make a "badge" show up on the NQ icon with your reputation score. You can choose which site the score will be of on the Options page. This feature requires you to connect your StackExchange account. This is a big change. So, please bear with me through any problems there may be. This update now uses version 2.0 of the API. It allows you to search multiple sites at once. You can also get inbox notifications if you connect the app via OAuth. Notifications now dismiss themselves after a few seconds. The UI has been polished up a bit too. Existing users will have to re-input their settings, I'm sorry for the inconvenience. Enjoy and as always feedback is appreciated. There is now a badge showing your reputation on the New Q! button. Clicking on the button now gives you a pop-up listing the questions and allowing you to pause/restart the notifications. This is useful if you need some distraction free time. This update as well as 0.8.1 and 0.8.5 were mostly bug fixes. A few new things: The logo of the website is displayed as the background in the notification. Some CSS improvements to the notifications. You can load in your favorite tags by clicking on the suggestion. The notification goes away when you click on the link in it as requested on the Chrome extension page. Fixed the bug where you received too many notifications when starting your browser. Your browser history is used to check what questions you've already viewed, so existing users must re-enable the extension for additional permissions. Tags that you use most often are suggested on the options page. Tags are shown in the notifications. Please tell me about any problems you find with this update. Thanks! I've already updated the extension on the Google Extension gallery so existing users will be automatically updated shortly. The source code changes are in the sourceforge SVN repository. If anyone has any ideas for additional improvements I'd love to hear them! 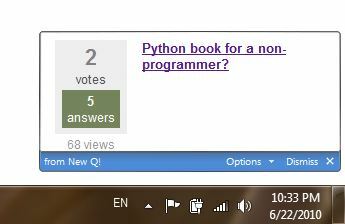 If a question from Stackoverflow, for example like this, contains html tag with <>, the tag is interpreted. So you will receive this question with an actual input. Maybe I should write something there, like sanitize - http://xkcd.com/327/. Could the notifications time out after a certain length, so I don't have to click every single one? 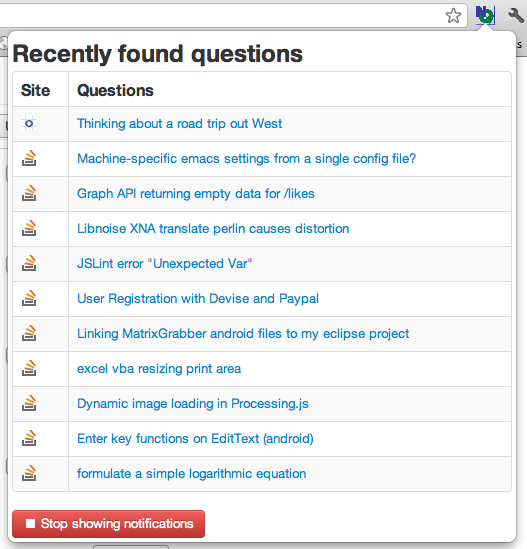 Also, could it be possible to monitor more than one stack exchange site at a time? I watch both SO and UX. Please add the feature of removing or hiding a question. If you read a question, and found it irrelevant, You should be able to remove it. So the list will contain questions you are interested in. I have using this for a long time , but I'm not getting any notifications now . I have tried with several tags no luck . 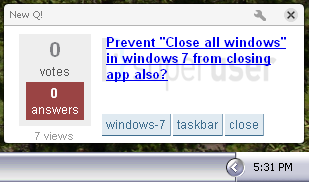 I'm on Windows 7, chrome version Version 30.0.1599.69 . I don't know if I'm doing something wrong, but every time I start Chrome (in Ubuntu 10.04), it informs me of the same 3 questions and the same 3 comments. I click dismiss, close Chrome, and open it again. Same thing. I love this extension and I love how I can monitor multiple Stack Exchange sites in version 2.0. I'm logged in with my Google account in Chrome and it's my impression that extensions can save their settings "in the cloud". So I would like to see the search profiles synchronized between different browsers. I sometimes add a new tag when I'm at work and it would be nice to have that tag appear automatically when I get home. This is just a small detail, but let's say I'm interested in tags foo and bar. I would then like to monitor these tags on Stack Overflow, Super User, and Programmers. It would therefore be nice if I could pick multiple stack Exchange sites for each list of tags. Right now I have to add three separate search profiles and copy-paste the tag list from one to another. Not the answer you're looking for? Browse other questions tagged app api-v2 chrome-extensions obsolete notifier .